"You take Fiction-Writing? That's an actual class?" The title is the exact term for my life. The plot is nice—sisters, fangirling? Sounds familiar! I can’t even contain my feelings in this book. The book technically inhaled me. When I finished it, I felt like I was spewed out and the next thing I had to do was talk about it. And since no one’s around the time I finished it, I had to write about it right away. The plot was simple and easy to follow. Nothing in this thing happened that shocked me or stuff. But what I know is it was beautifully and captivatingly written. It was written to just hug you tightly and to make you feel warm and fuzzy (well, that’s what I felt most of the time.) 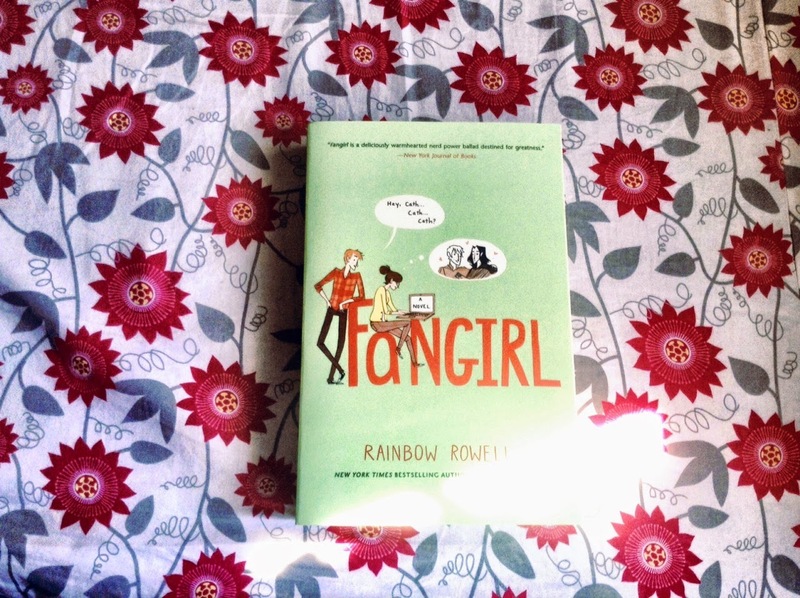 Rainbow Rowell’s words are wonderful—from Fangirl itself to Simon Snow. However, Simon Snow quotes would have been better if we could read an actual Simon Snow text. It was made to comfort the reader, especially since I feel the proper audience of this book was very specific. It was made to be able to relate. The reason why it was loved by its audience was because it could be relatable in a million ways possible. I can say very well that this book is for me, and that it reached out to me, and that I was able to relate to Cath in a hundred million ways. The book was human. The emotions the characters got, the plot itself—it was all very real for me. The things presented on the novel were actual things a girl finally leaving her comfort zone were true. The constant company of someone she has been with since childhood, the comfort of home, and the world telling her to leave behind the things that defined her childhood. 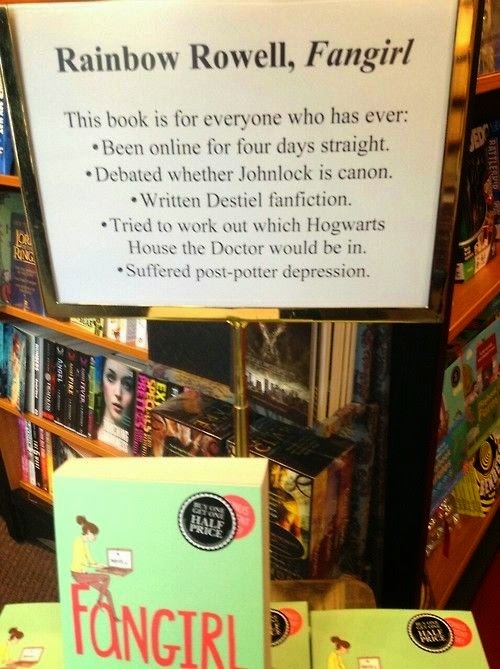 It’s all part of growing up, and Fangirl is one way of showing how things wouldn’t always go well right away, and that it had to be in the right time, in the best way it can teach. Cath was almost me in various ways. Not just because I’m an indoor person who likes my jeans and comfortable pajamas all the time, but because I sort of deal with some things the way she does. I could relate to her a lot. And also, if I was presented with a Levi infront my face, even if he had a girlfriend, I would still like him. Like like. Being an almost Cath, I could say that Levi was fitting in various, wonderful ways. I really liked his role. And I liked how Levi was there to make Cath better. Cath may have had problems with herself and while Levi may have improved her love life, but I actually like how Levi improved Cath’s outlook on life. And also, I liked how Levi wasn’t the typical perfect and handsome and hot YA hero but he was the perfect guy for Cath. I also love how Reagan and Wren. Reagan stands out among other the other friends of the protagonist. She had that sass in her, but just enough sass to make her an awesome and memorable character. Meanwhile, I also think that Wren’s part in the story is important especially since there are teens who like to explore the way she tried to explore in college. We may be more of a Cath, but I guess we also try and wonder what is like to be Wren sometimes. She’s a lesson that as much as possible, we should keep track of what we are doing, and we should try to evaluate if what we are doing is helpful. I guess her redemption was Cath’s redemption too, in a way. I guess I loved this book because it was such an easy, comforting, and warm read. It’s not the typical coming-of-age book where the protagonist likes to set out and break free from the norm—it’s the kind of coming-of-age where the protagonist is afraid to break free, and this book tells about how she will in between the crazy things in her life. Here's a book to totally lift you up if you're feeling really weirded out if you don't feel like your type of life is so much more different than the one you're expected to be like.